This is not your traditional pasta recipe! 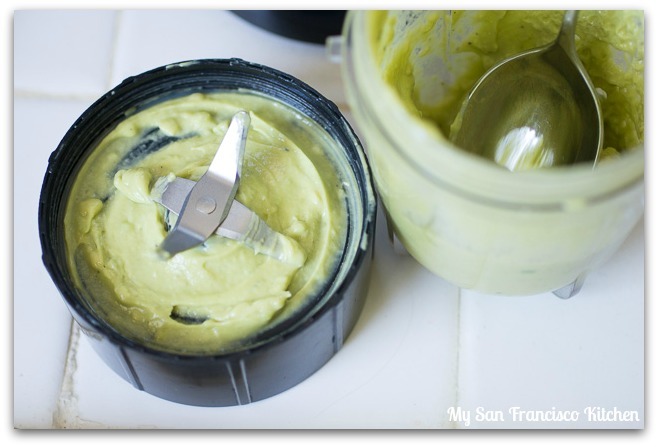 It may sound strange at first to make a pasta sauce using avocados, but I promise this avocado pasta sauce is so so so delicious! Ripe avocados create a creamy texture, and lemon, garlic and Parmesan cheese add in lots of flavor. I love creamy pasta sauces, like Alfredo sauce, but they are usually incredibly fattening. When you add that to a huge bowl of carb-heavy pasta, you are asking for some weight gain 😉 I also usually feel unhealthy and sluggish afterwards. This avocado-based pasta sauce is a healthy alternative, and I actually like it better than Alfredo sauce! No butter or heavy cream needed here 😉 This is a really quick and east vegetarian dish. This week I started my post-baby workout training. I am finally feeling ready to get back into shape, and my goal is to get into better shape than before I was pregnant! I have 12 pounds to lose to get back to my pre-pregnancy weight, and after that I want to tone and add muscle. I know it will be hard work, but the results with be worth it! Here is the plan for now: cycling 2x/week, running + strength training 2x/week, cardio dance + stairmaster 1x/week, swimming 1x/week. My doctor advised a weight loss of 1lb a week, which means I have to start slow and eat a lot to make sure I don’t lose too much at once and help my body build muscles. Since I am nursing, I am already burning a lot of calories! Losing too much weight and dieting can affect milk supply, so it will be a challenging balance. It feels great to work out again, after 10 months of only walking and yoga. 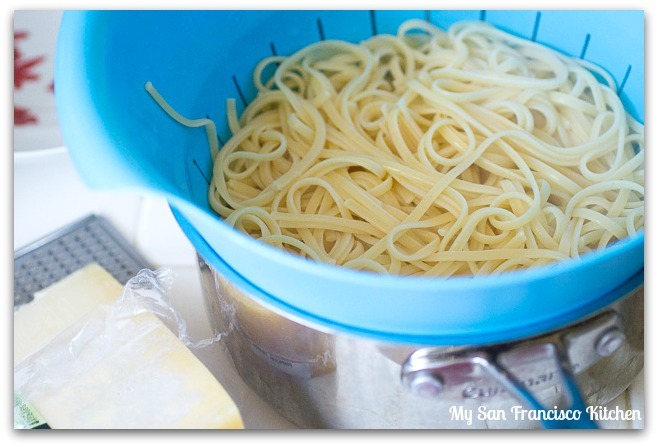 Cook the linguine noodles per package directions, strain and set aside to cool slightly. Slice the avocado in half and twist apart. 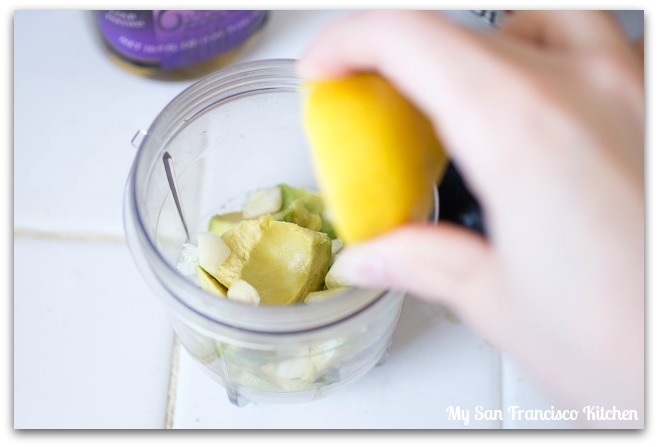 Remove the pit and scoop the meat out with a spoon into a blender or food processor. Add the remaining ingredients, holding the parsley for the topping, and blend until smooth. Add more olive oil for a smoother texture. Toss the avocado pasta sauce with the noodles. 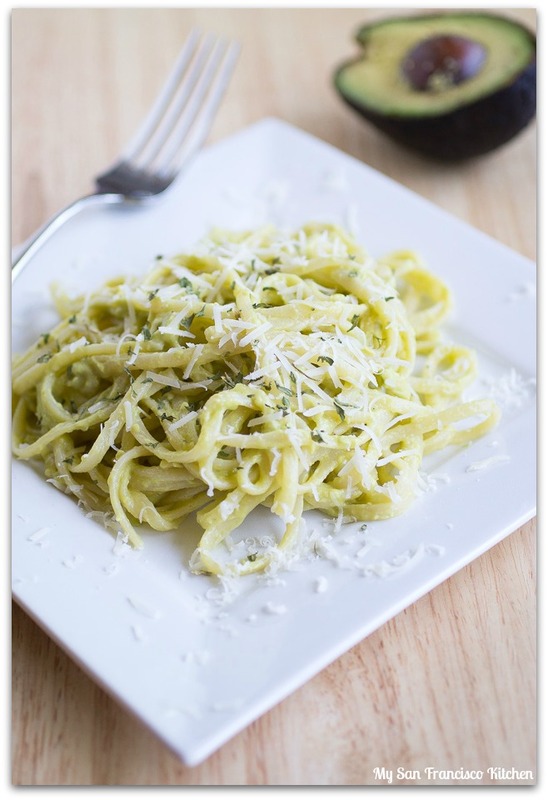 Top the avocado linguine with freshly grated Parmesan cheese and chopped parsley. This entry was posted in Dinner, Lunch, Organic, Vegetarian and tagged avocado, healthy, linguine, pasta. This recipe looks great and easy to veganize, thanks. And that’s great about starting the diet, good luck! Thank you for sharing such a delicious looking and sounding recipe! Very healthy too. Compliments to you. Made it just like it’s written. Very good taste. I then added some 1/2&1/2 to thin it out. Tried a small sample with a little Frank’s hot sauce. That’s good too!